(ABN 38 068 209 610 ACN 068 209 610). 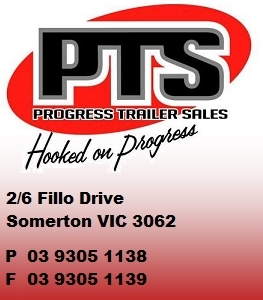 Progress Trailer Sales shall be referred to as "PTS" here under. 1. These terms and conditions apply notwithstanding any inconsistencies which may be indicated in the customer’s order or acceptance unless otherwise expressly agreed in writing by PTS. 2. A quotation shall not be construed as an obligation to sell or hire and no contractual relationship shall arise until the customer’s order has been accepted by PTS. 3.3 any other indirect expenses incurred by PTS. 4. Unless otherwise agreed by PTS in writing all goods and services will be charged for at the price applicable at the date of delivery. 5. Subject to clause 6 the price for goods and services is to be paid net cash within 30 days (in the case of spare parts), or in the case of all other goods and services within 7 days of the date of the invoice. 6. PTS may vary the terms of payment by giving notice to the customer and may require payment in cash in full prior to delivery. 7. Any description of goods or services in given by way of identification only and the use of such description shall not constitute the contract a sale by description. 8. All conditions and warranties expressed or implied by statute, common law, equity, trade usage or any other reason are expressly excluded to the maximum extent permitted by law. 9. PTS shall be under no liability to the customer for any loss or damage to persons or property or for death or injury caused by any act or omission (including negligent acts or omissions) of PTS. 10.2.2 the payment of the cost of having the services supplied again. 11. Subject to any legislation or express agreement to the contrary, the customer acknowledges that any advice or recommendations given by PTS in relation to whether the goods or services to be supplied are fit for any particular purpose, shall be accepted by the customer at the customer’s risk. 12.7 any other order or direction by any Local, State or Federal Government or Government authority or instrumentality. 13. If PTS determines that it is, or may be, unable to deliver with a reasonable time or at all the contract may be cancelled by PTS. In the event of cancellation the customers shall have no claim against PTS for any damage, loss, costs or expenses whatsoever. 14. The customer shall not be relieved of any obligation to accept or pay for goods by reason of any delay in delivery. 15. Any claims for incomplete or wrongful delivery of goods or services or faulty workmanship must be notified in writing to PTS within 14 days after delivery and any claim not so notified within that time (time being of the essence) shall be deemed to have been absolutely waived. 16. All goods sold by PTS to the customer shall remain the sole and absolute property of PTS as legal and equitable owner, and property and title to the goods shall not pass from PTS to the customer, until the customer had paid for the goods in full. 17. Until the goods are paid in full, the customer shall store and use the goods separately form its own goods or those of any other person in a manner which renders them clearly identifiable as the goods of PTS and shall not allow the goods to be incorporated in or used as material for other goods. 18.1 authorise PTS to enter any premises where PTS’s goods are or may be situated and to use such reasonable force as may be required to enter such premises, including the breaking of locks or chains which secure the premises. 18.3 indemnifies PTS against any cost or expense of all claims, actions or suits whatsoever arising from the entry by PTS into or upon any premises where PTS’s goods are or may be situated, for purposes of PTS taking possession of its goods pursuant to this clause. 19.3 the physical delivery of the goods to any carrier (whether it is the customer’s nominated carrier or not) whichever event occurs first. 20. Once the risk of loss or damage to the goods passes to the customer pursuant to clause 19 the goods shall be at the customer’s risk absolutely and the customer shall be responsible for obtaining insurance cover against all possible risk and contingencies. 21 notwithstanding any other terms and conditions the customer may sell the goods to a third party if the normal course of business and deliver them to that party provided that until PTS is paid, the customer holds the whole of the proceeds of sale to the third party (and claims for those monies due) on trust for and on behalf of PTS. 22 Failure by PTS to insist upon strict performance of any term, warranty or condition of the contract shall not be deemed a waiver thereof or of any rights PTS may have. Further no express waiver shall be deemed a waiver of any subsequent breach of any term, warranty or condition. 23 Failure by PTS to insist upon strict performance of any term, warranty or condition of the contract shall not be deemed a waiver thereof or of any rights PTS may have. Further no express waiver shall be deemed a waiver of any subsequent breach of any term, warranty or condition. 24 If payment due under the contract are made within seven days (7 days) of the due date interest will be charged at a rate of 2% above the interest from time to time charged by PTS’s bankers for advances on overdrawn current accounts (on amounts not exceeding $100,000) calculated from the due date of payment until payment is made in full. This interest is payable to PTS by way of liquidated damages. 25.1 Any breach of failure of the customer to observe or perform the terms, warranties or conditions of the contract. 25.2 The exercise and/or enforcement (or attempted exercise and/or enforcement) of any of PTS’s rights or remedies from the contract. 26 Any notice to be given by the customer to PTS shall be in writing and be sent by prepaid mail to PTS’s business address. No notice shall be deemed to have been given until it is actually received at such business address.